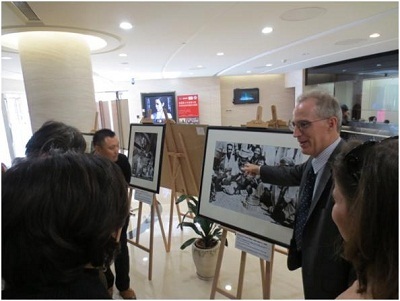 To celebrate Jazz Appreciation Month (April) in China, the U.S. Consulate exhibited Meridian’s Jam Session – America’s Jazz Ambassadors Embrace the World – a collection of photos featuring 20th-century jazz greats like Dizzy Gillespie, Benny Goodman, Louis Armstrong and Duke Ellington – at the hip, space-age venue, Shanghai Culture Square. The exhibition complemented other jazz-related events at the Culture Center in April 2013, which included youth workshops, film screenings of jazz documentaries, roundtable discussions, as well as an outdoor concert with the Anne Evenou Quartet. 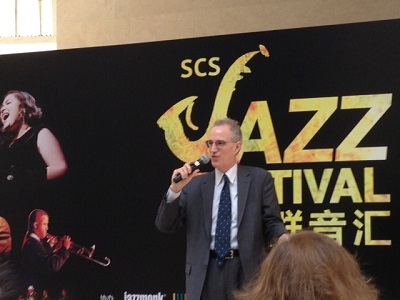 The Jazz Festival at Shanghai Culture Square concluded on April 30 with a full program of events throughout the afternoon and evening to celebrate UNESCO International Jazz Day. Jam Session chronicles the international tours of legendary jazz musicians selected by the U.S. Department of State to serve as roving cultural “ambassadors” from the 1950’s through the 1970’s. Over 100 compelling images, together with posters and other materials, portray the journeys of music greats such as Dave Brubeck, Louis Armstrong, Duke Ellington, Benny Carter, and Sarah Vaughan. The exhibition, which has been on display in more than thirty five countries and viewed by millions of people, demonstrates the richness of American cultural heritage and serves as a powerful public diplomacy tool.